A glimpse of justice was experienced yesterday by the tenants of several Bushwick buildings owned by the infamous landlord brothers, Joel and Aaron Israel. The brothers were arrested yesterday, and indicted on 15 counts that ranged from grand larceny to burglary and falsifying business records. The brothers own 10 apartment buildings throughout Brooklyn, many of them in Bushwick, face up to 15 years in prison, according to the Brooklyn DA’s office. 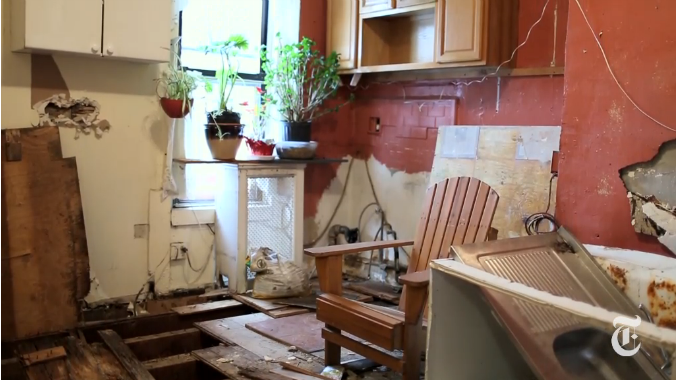 The landlords allegedly intentionally wrecked and made unlivable tenants’ apartments at 324 Central Ave, 98 Linden and other buildings in an attempt to drive the rent-stabilized tenants out. They have also lied to city officials about the work they were doing. In court on Thursday afternoon, Joel Israel, 34, and Aaron Israel, 37, pleaded not guilty to seven charges, including fraud, burglary, grand larceny, submitting false documents and unlawful eviction. Judge Danny K. Chun set bail at $75,000 for the younger Mr. Israel, and $50,000 for his brother. The prosecution of landlords is rare, wrote NY Times, but in this particular case the tenants' complaints against the Israels have been going on for years. The tenants in rent-stabilized apartments are guaranteed a lease renewal and their rent can go up only a certain percentage defined by state law. As a result many Israels' tenants have been paying less than a market value of their rent. (At 98 Linden St. the tenants pay between $650 and $700). Israels allegedly created hazardous conditions to force them to leave, and so that their units could be rented out at much higher rates. What are the brothers charged of? At 98 Linden St: The landlords allegedly paid workers to take a sledgehammer to the floors, leaving the bathroom and living room unusable. Tenant Michelle Crespo told Brooklyn Paper she was forced to take her 15-year-old and 12-year-old sons to a neighbor’s place or to a nearby McDonalds to use the bathroom for more than a year. Through the holes in the wall, she could see her neighbors apartment, and rats and stray cats frequently squatted in her apartment and sometimes died there. At 324 Central Ave: Landlords illegally entered the tenants' apartment while she was at a doctor's appointment last year and locked her out, prosecutors said. The police let her back in where she found men demolishing her kitchen and bathroom. The Israel brothers then allegedly filed for false construction permits while denying anyone lived there and did not indicate that the apartment was rent stabilized, prosecutors said. At 300 Nassau Ave in Greenpoint: The tenants won a court case against the brothers in February. Apparently, the brothers paid someone to take an axe to their boiler, thermostat, and electrical system. The court has appointed an independent administrator to fix the building, however the tenants, who have been staying with relatives or in homeless shelters, will not be able to return for a couple of months. To give you a better idea about the extent of damage and the horrific conditions the tenants (some of them elderly or children) lived at their Bushwick apartments, watch this NY Times video from February.